AnonD-15310, 28 Jul 2011 you trolls don't understand,. go to your phones room. you see some people know this phone has... moreThe N9 will flop. It will be released on a few select tiny markets while the Sea Ray will be released on the rest of the world. People don't care about MeeGo. They don't even have the slightest idea what MeeGo is. It got zero presence in the market and it won't bring us money. hey nokia haters! admit it n9 is way too beautiful than any other phones combined out there.. n9 is so clean and smooth.. the specs... just awesome! vel, 28 Jul 2011When is the samsung S2 3d geing released. I am really ready with the cash. to have it pleas... morecom'on mate sgs2 needs battery car so you can last a day. Nokia has proven itself already, countless times. n9 will just blow your sgs2 away.. by they way, why you trolls are here in nokia forum? aren't happy back there in samsung forum? admit it, you made a wrong choice in buying that sgs2... crappy plastic anyway. specs??? it won't match n9's. Anonymous, 28 Jul 2011some answer me pls?? Why would you buy this phone when you already know that n9 is on a dead O... more you trolls don't understand,. go to your phones room. you see some people know this phone has a future. meego is not dead OS. it has support and nokia confirmed it before. this phone can run android apps and full desktop linux apps, which mean good for future powerful apps. the ecosystem is Qt. qt made easy for devs to code once and deploy to different platforms' devices(handsets, netbooks, IVIs, handsets and tablets) in just one click. Elop the CEO of Nokia just mad a statement on earlier that qt is Nokias ecosystem and it will live on next billion s40 devices. means we have lot of apps coming soon for N9. meego is not like android. android apps run on java virtual machine, but meego is full linux based. have you heard of n950 which were freely given to meego devs. it means it is just not dead. it is a media lie. some answer me pls?? 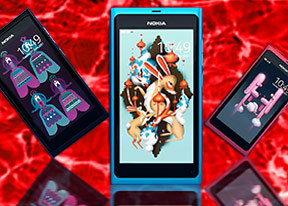 Why would you buy this phone when you already know that n9 is on a dead OS? Why would you buy this phone when there are clearly way better phones than this one? Is it because you are just ignorant or do you really think it is a good phone? Just hoping this baby is on the way to the UK. Meego DOES have a future. We just have to convince certain people of the fact. When is the samsung S2 3d geing released. I am really ready with the cash. to have it please suggest me, please make in possible soon waiting for this device. ali, 27 Jul 2011Once i was a symbian gheek and nokia lover,i almost kept every nokia symbiaen fone n wasted so... moreits mean u don't know about meego os. First learn about then say some thing agains meego. Android is based on like meego os. Meego is father of android. Have got now hate nokia. Those who don't know about meego they can says android is best. Good luck of android user from now. Anonymous, 27 Jul 2011Save your money and get a samsung galaxy s2. It's the best. Nokia is suffering and their os is... morecan s 2 have like nokia push mail with great ovi map and contact supporting. In nokia i did not miss a single contact number in 7 year now i have 5000 contact number with email id. Can s2 give this type of services. Meego vs WP7 in the future would be amazing. Thanks for nokia haters because they brougth nokia round. AnonD-15310, 28 Jul 2011nice phone. meego looks good.i heard nokia will support meego in future and there will be many... moreThe N9 will be available in about 23 countries, in mid-September. nice phone. meego looks good.i heard nokia will support meego in future and there will be many updates for it. i trust maemo community as they brought supports and update for n900. android can run on this beast. so i am looking forward for this phone. when will be out? price doesn't matter. whats for 64gb? does n9 support themes (symbian ^3 themes) plz answer it ,itz very important for me !